Looking at Joseph Genuardi, you’d never expect the old soul that lurks within. He’s well-dressed with slicked-back hair, polite, and soft-spoken. 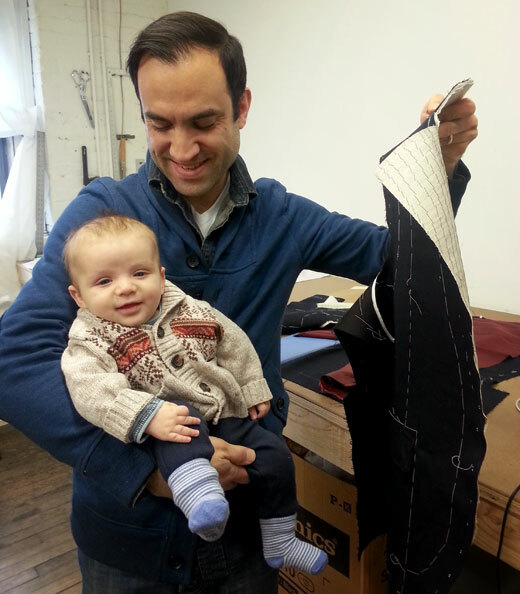 What you won’t get at first glance is that he’s a trained master tailor with educators who had more than 75 years of experience, a five-month-old son who is well on his way to becoming a tailor himself, and the ability to make a mean suit. 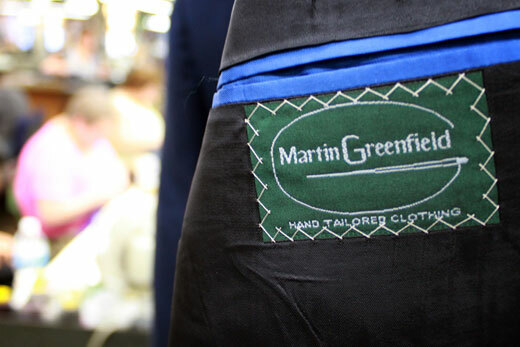 Joe is currently Head Tailor at Martin Greenfield Clothiers—a name well-known for hand-tailored mens clothing—amongst the best of the dressed. 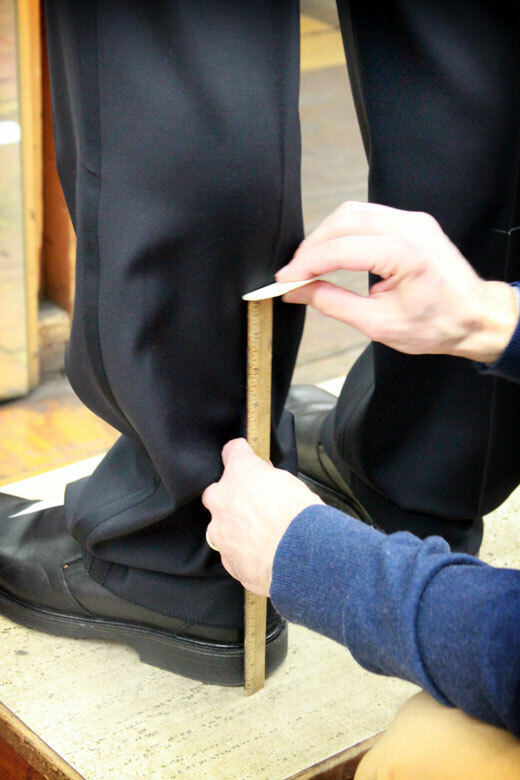 Custom tailoring has quite the history, as do the most accomplished of tailors. But those accomplishments are more readily measured by the smiles of those fitted in a brand new custom suit than public recognition—and because of that, it may seem like the title of Master Tailor is slowly meeting its end. 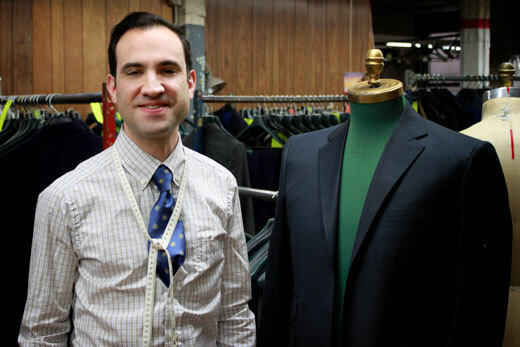 Joseph is living proof that the craft is alive and strong—and that everyone should get to know their local tailor (not only for their craft, but also the great stories they’re bound to have). We were first turned on to Joseph and his story at a viewing of “Men of the Cloth,” a documentary following a number of master tailors and their stories—Joseph’s weaving its way in, as well. Nicole spent some time getting to know Joseph and the art of becoming a tailor. Get ready to be inspired! Joseph Genuardi: My undergraduate was in industrial design at Carnegie Mellon. I loved it, but late into my college term and early into my working career this idea popped into my head that it would be awesome to make suits. I started doing some art direction—product design and graphic design—and I saw myself move toward clothing. I launched a graphic T-shirt line where I was designing the shirts and having them printed in Philly by a local silk screener. I would sell them in boutiques in the area and at art fairs. The tailoring idea came back to me, but much stronger than the first time around. I love the idea of providing a product that adorns a person throughout their daily life and their accomplishments, trials, and challenges. I didn’t know all that much about custom tailoring. I had this instinct it would embody all of my interests as an artistic person and also as a creative professional. You really get a lot of the technical aspects of industrial design like 3D visualization, drafting, usability, and beautiful curves and lines. In essence, a suit is really a product—a highly functional and highly intimate product that accompanies people on a daily basis. I have always really bonded with my clothes—I wear my clothes really hard, but I develop a loyalty to them. They carry you through interesting experiences. There’s a romantic aspect to that I really appreciate. I love the idea of providing a product that adorns a person throughout their daily life and their accomplishments, trials, and challenges. You’re working with beautiful materials—cashmeres, silks, and wools. This is part of why I think tailoring is the perfect thing for me: You’re creating something from scratch and you can control the entire creative process. You’re making a one-of-a-kind item. It was a product that I could really get my head around in terms of the details. I like the manageability of a suit—I don’t have to reinvent it. I hone in on tiny nuances and master the clothes. The gentleman I apprenticed with was Joseph Centofanti, a renowned master tailor. He spent some time in Italy and Africa and ultimately came back to the United States. He had a 75-year career or more as a tailor. The wealth of knowledge embodied in one person was astounding. It was such an amazing opportunity to work with somebody who was that knowledgeable and willing to share his knowledge. We really didn’t have a structured education program, per se. It was me going to him with my initiative and this crazy idea that I wanted to learn the craft and him with the idea that maybe I had what it took to dedicate myself and actually be a successful apprentice. 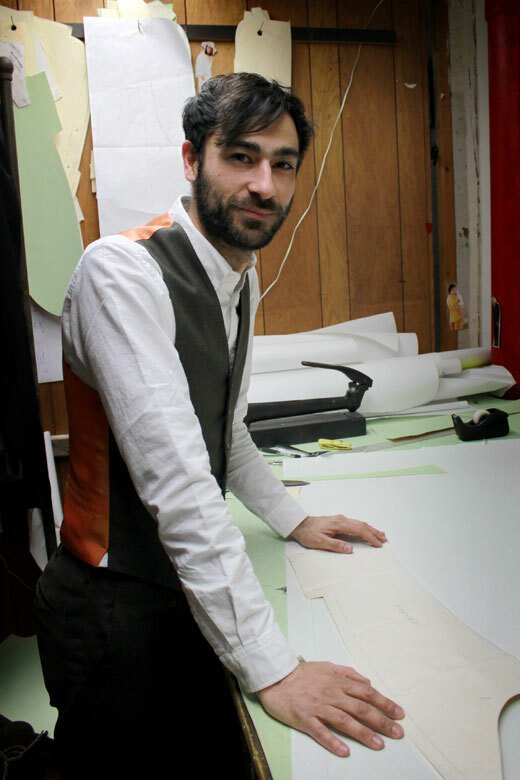 It was important for him to pass on his knowledge because it is in fact a very rare thing to find young tailors. It was important to him to pass on this trade that he had loved and carried throughout his life. All in, I was with him for about five years, which is longer than it takes a doctor to go through their schooling if you think about it. At the same time, I began to work in his shop and take on more responsibility as an employee. That experience in itself was really rewarding and challenging. When I started, I was a blank slate. When I left, I was cutting all of the suits, doing all of the fittings, re-marking all of the suits after fittings, and managing work with the other tailors. We had two in-house coat makers, an alterations tailor, a pants maker, a button hole and finishing sewer and a couple of front-of-house people. It was a pretty small operation, but an amazing experience in all. Every task that’s given to you is an opportunity to learn something. There were a lot of challenges. The first thing was how young I was. Secondly, there was a bit of a language barrier—not with Mr. Centofanti, but with the other tailors. I was kind of a new concept. You’re dealing with old guys—Italian, very strong-minded, passionate guys—who are also masters of the trade. So you’re talking high-level craft people, and then there’s this young guy coming in who knows nothing. I think it just took a while to gain their respect and prove my respect for them and their craft and that I was there out of admiration for what they did. It was really important to humble myself quite a bit. My perspective was to go in there and be a sponge. Every task that’s given to you is an opportunity to learn something. Embrace it. Humility, respect and work ethic were all big aspects. I didn’t pay Mr. Centrofanti and I didn’t make a lot of money, either. My payment to him, in my mind, was my dedication. What does the teacher want out of this barter? If I were a teacher, I would just want to know that my student is excited, dedicated, and hard working. I always struggle with this question. I don’t know if I’d consider myself a master tailor. To me, the goal is to always keep pushing yourself. I’d say as a benchmark, if you’re going to at least begin to master something, five years is definitely a good amount of time to spend learning the basics and practicing them. I feel like the concept of practice has been lost a lot in my generation. We all go to college—and college to me is basically a survey of what you want to do, an introduction. It’s a stepping stone of getting into the meat of what you want to really be doing. It’s not until you get into the workplace and actually work day-to-day and get those hands-on experiences that you really start to learn something. I don’t think anybody knows that much coming out of college. That’s not to slight a college education—I would never change my path. That being said, I think the expectation coming out of school is often times much too high. Many people expect a lot of money; they expect the dream job. They want to be a rockstar in whatever field they’re studying. I don’t think that happens very often. How Many Master Tailors Are There? I don’t know a specific number—there are a lot. I think sometimes when you talk to the older master tailors and people in the industry, there’s this dark cloud of morbidity about the trade. I don’t think in any sense that the trade is about to die or that the last 15 tailors are getting ready to retire and check out. I don’t think it’s ever going to die. I think the crossroads the trade is at right now is more of a passing moment of maintaining the high standards that were in place when there were tailoring schools and apprenticeships—the mentality that those programs instilled in young tailors. It’s very important to carry on in the right fashion with the trade. You can very easily fall into this situation where what was once a very articulate, detail-oriented process becomes mass marketed or outsourced. 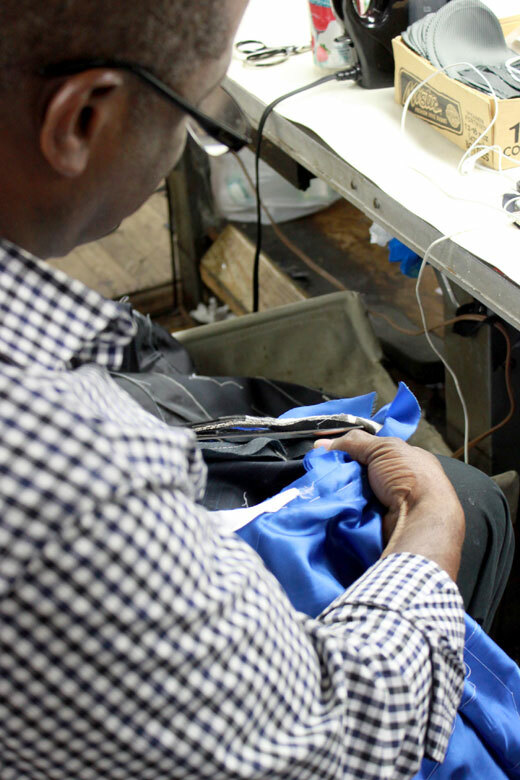 The work gets into the hands of people who may not have the same background that the older tailors have. You run this risk of sacrificing some of the quality and techniques—it’s important not to lose those things. 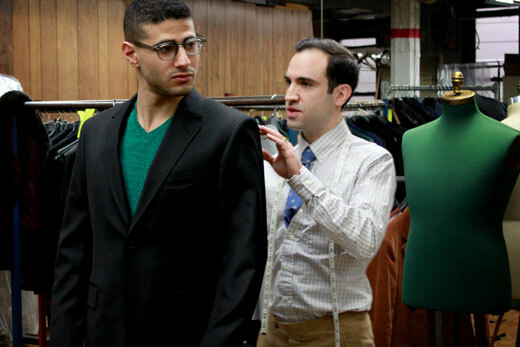 To streamline the custom process, we carry stock size garments—a library of suits. So when someone comes in, you can have them start by trying on something that’s close to their size. You can immediately read things about their posture and their style. You can talk about the length of the jacket, how fitted it looks, the width of the lapels, do they like a narrow shoulder or a more structured shoulder, etc. You eliminate a lot of the variability straight away. So when you do sit down and actually draft a pattern, you’re that many steps further along in the process. We can skip a basted fitting and instead, by the time they come back, we have a slip-on ready, which is basically 70-80% finished. After that, the final fabric, lining, and pockets are cut. 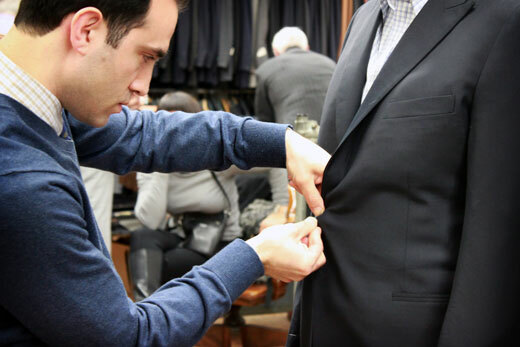 We rarely have to do major alterations—it’s usually a nip and tuck here or a sleeve adjustment. If more needs to be done, we have a factory at our disposal. We could easily take the whole suit apart and rebuild it if we had to, but that’s usually not the case. We always have a really good delivery rate—99% I’d say. On any given day, I’ve got probably 200-300 suits in some phase, from having just been ordered to having just been delivered. That’s just personal clients. We also do production for some designers, and make stock suits that we sell on GILT (ready-made suits), which is a whole other side of the business. 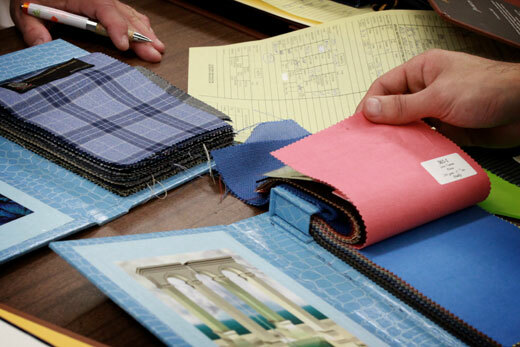 There’s a much closer relationship between the different people involved in making a custom-made suit. There’s something to be said for that—it adds value and another level of refinement. I don’t want to make it sound like a made-to-measure suit or special order suit is better or worse—I think there are trade-offs. 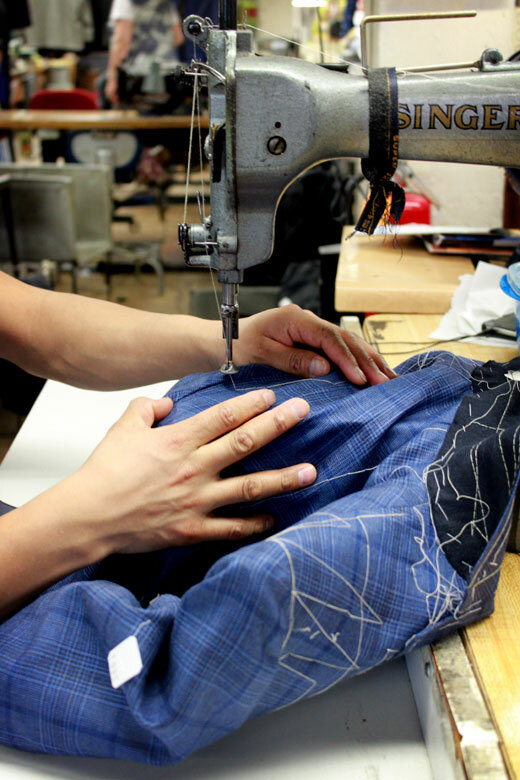 What’s happening with factories in China—"tailor shops"—is that they’re sending measurements off, making the suits in China, and sending them back. Other places might take a stock garment and alter it to fit someone in the store. There are different levels and yes, you do sacrifice the beauty of a bench-made tailored suit with those. 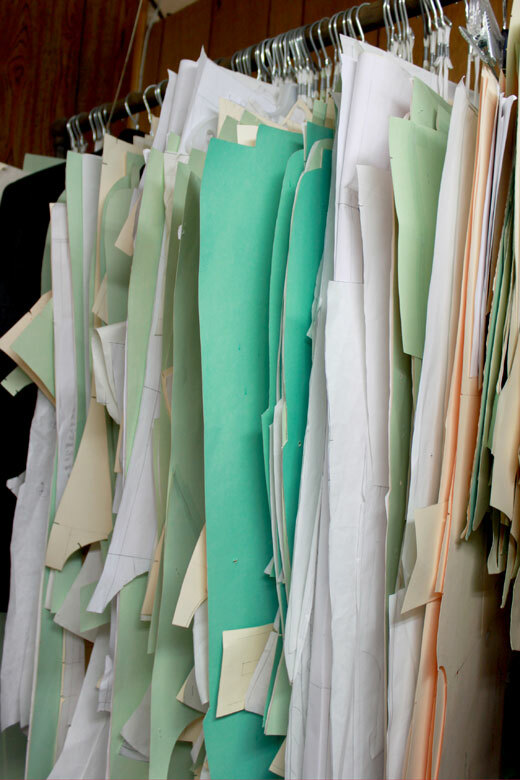 First, you’ve got one tailor making your jacket from start to finish. Maybe he’s there for the fitting, or maybe he’s not. He’s at least in direct communication with whoever fit your suit or measured your pattern. I think there’s a much closer relationship between the different people involved in making a custom-made suit. There’s something to be said for that—it adds value and another level of refinement. In general, quality-wise, with an off-the-rack suit or a custom suit, you definitely want to make sure the wool, cashmere, cotton, whatever it is, is of good quality. All of those things are a part of a custom-made suit. It would be silly for a tailor to spend so much time hand-crafting a suit and use crappy materials. There is also the personal relationship. Let’s say you make 10 suits a week. You’re a lot closer with those 10 customers than if you’re making 1,000 suits per week. The smaller production allows you to really hone in on individual customers and their needs, style, and preferences. That’s of great value. I have to have my own shop and be working on stuff— just keeping my hands on the work. Now I’m very busy at home with my son and my wife, but I’ll sneak out after dinner during the week. I do have a designated “studio night” now. You’ve got to carve out time or life sweeps you up. I love my studio. The light is great in there; it’s my own little cubby. I have everything I always dreamed about when I was an apprentice: specifically, a cutting table where I can lay out an entire suit-length on it and draft on it. I wish there was video tape of my progression, shop-wise. The things I was doing when I started in my parents basement building tables and having to clear off the entire table to draft and put the muslin back on to press things—so much back and forth to do one stupid little task. It’s really exciting when you have your space set up just how you want it. I have an old, crappy laptop that can play music, but I won’t bring other things in. I’m easily distracted, so I make it a point to strip everything down. I’m only going there to work.